Diamond Credit Union celebrates raising $73,341 for the American Cancer Society during the 2018 Relay for Life season. Diamond has raised $883,541 during its 13-year partnership with the American Cancer Society. 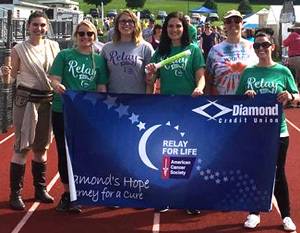 Nearly all Diamond employees support Relay For Life by participating on the Diamond’s Hope Relay team, or by organizing, implementing, participating in, or attending several year-round fundraising events. Fundraising events are well-supported by Diamond members, vendors, business partners, friends, and family who make this total donation possible. This year, Diamond’s Hope participated in the Western Berks and Pottstown Relay events. During Relay events, teams have at least one member walking or running around a track at all times. Events often run for 24 consecutive hours. Having team members walk for 24 hours represents the 24-hour-a-day battle against cancer. Coming together to fight cancer…That’s younity! Read more about Diamond’s involvement in community, our new Royersford branch, and much more.